These are the pistons you need if your building a serious 351W with Twisted Wedge® heads. Trick Flow® forged pistons are specifically designed to work with Trick Flow® Twisted Wedge® and Track Heat® cylinder heads. These fully skirted, lightweight pistons are precision-machined from premium 4032 aluminum alloy. They perfectly match the unique chamber and valve angles of the Twisted Wedge® heads, making them ideal for more serious engine buildups. Approximate compression ratio: 408 stroker, 10.0:1 with 61cc chambers. Piston Style: Dish, with no valve reliefs. Compression Distance (in): 1.290 in. 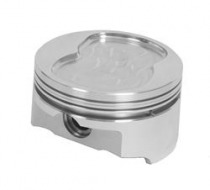 Piston Head Volume (cc): +20.30cc. Wrist Pin Style: Press-fit or floating. Note: Due to the multiple variables possible with any engine combination, all compression ratios listed are approximate. To accurately calculate the static compression ratio of any engine, the following values must be known: Bore diameter, stroke length, rod length, deck height, combustion chamber volume, cylinder head gasket compressed thickness, and cylinder head gasket bore diameter.